One rare evening, I chanced upon TV Patrol (a local news program) featuring the long beach of San Vicente, Palawan stretching about 14 kms, probably the longest in the Philippines. The idea immediately came to me that I shall visit the place one of these days. 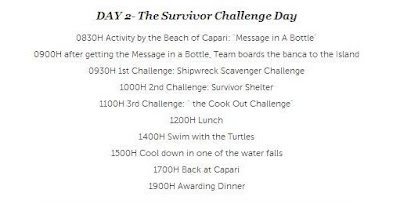 A few days later, deal grocer flashed a deal called Capari Survivor Getaway. Ecstatic about the listed itinerary, I sent out an invite to my travel buddies. 8 young professionals overwhelmingly responded to my invitation. Capari Resort is located in a very remote area in San Vicente, Palawan, accessible by private van for four hours on extremely rough road more than half of the time from Puerto Princesa. The road condition worsen especially on a rainy day. As part of the package, we were picked up by a van at the airport. The van wasn't a private van of the resort but one used to shuttle tourists or available for hire. Upon reaching Capari Resort, I was taken aback by the ambiance of the resort, it didn't appeal to me. The rooms are small, equipped with very basic ammenities. The bed for two is a double bed (queen or king beds are not available). Third person is charged with mattress laid out on the floor, the room is too small that by doing so, the room can only be half opened. Mosquito nets (except for the extra bed) is hanged overhead. Obviously, mountain mosquitos is abundant in the area, insect repellant is a must. Food is tasty but portions is extremely small and expensive for its serving. Capari Resort is located on a cove on its own, with the beachfront privately accessible by its guests. The beach sand is fairly fine and white, but sand fleas is abundant, rain and waves can also be strong in months other than February to April. If you are looking for a place to stay near the long beach of San Vicente, this is not the place. Overall, we left Capari Resort disappointed. Half of us headed to El Nido, savoring the remaining good vibes that was left. We could have let it pass but subsequent events led us to believe we were deceived. We were not here for the resort, nor for the food, not even for the beach. We were here for the so called "Capari Survivor Challenge". It challenged us in a different way though... what was promised was not delivered, not even an attempt to deliver, we had to prod them several times even for the simpliest task to do a briefing. Looking back, there were signs that the resort wasn't actually true to their offer. They quickly respond to inquiries via email or phone however, as soon as we bought the vouchers, they hardly reply. A week has passed, we haven't heard from Capari Resort. On the other hand, Deal Grocer in a matter of hours agreed to refund the full amount. This was the gist of our complaint as written by my friend sunjun. · To show that the deal was grossly overpriced. · To show that it was false advertisement. · To show the lack of intent from the resort to deliver and provide what was promised. · Since there were 9 of us, we bought 2 coupons and opted to pay 8,600 pesos, as quoted by the resort manager, for the extra person. · The group stayed at Capari Resort from June 2-4, 2012. · The reservation was made around the last week of March 2012. · According to the Deal Grocer site, the whole package was valued at 80,800 pesos but it was being sold at a 60% discount of only 38,400 pesos. Lunch and Merienda estimated at 750 pesos per pax per day. 750 x 4 x 2 = 6000 pesos. · According to our research, subtotal of the whole package not including the Survivor Challenge and resort activities is only at 34,000 pesos. This led us to believe, by simple arithmetic, that the remaining Survivor Challenge activity must be worth around 46,800 pesos. "The package for deal grocer is a special one of a kind deal. We even went to the extreme by having 20 performers welcome each survivor group as a kick off for the "Survivor Getaway" package. We have combined survivor challenges and island hoping in one trip. The package has really been down played in Dealgrocer." · Estimated cost: 750 pesos for lunch and snacks, Breakfast is complimentary with the rooms. · The resort sent us Set Menus for the Deal Grocer package just a few days before our visit to the resort. 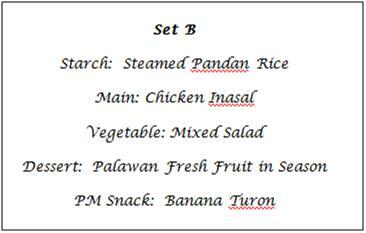 · For day 1 we chose Set Menu B. Late lunch was requested due to limited availability of flight schedules and flight delays. · Set Menu B as emailed to us by the resort. · Set Menu B as served by the resort on June 2, 2012 for 3 persons. · This was served together with a few slices of Watermelon as well. And instead of Banana Turon, we got a handful of Camote (sweet potato) covered in caramelized sugar. I leave it up to you to decide whether our estimate of 750 pesos is reasonable. · We ordered 2 bottles of Coke and were charged for the drinks. We presumed that drinks are not included in the set meals. · The second group from Cebu arrived around 5 to 6 pm and was served the same menu except the Camote was no longer available. · For breakfast we ordered a mix of Longganisa, Lamayo, and Tocino. We have no complains. Generous portions, tasty, and delicious. Water, Coffee, and Juice were available as well. 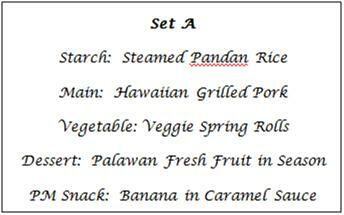 · For lunch, we ordered Set A and Set C. Here are the menus as emailed to us by the resort. · According to Ron-ron, the resort staff who took our order, the fish in set C would be around 250 grams. We were worried that it might not be enough so we ordered an extra fish to go with it. 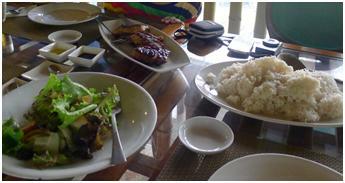 · Here’s our lunch as prepared by the resort on June 3, 2012. · The Veggie Spring Rolls in set A were missing. Instead we got grilled vegetables. · We paid for the extra fish. I leave it up to you to decide whether our estimate of 750 pesos is reasonable enough. 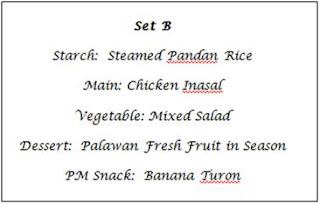 · In addition, note that this menu was prepared for 9 people. We paid for an extra person rate of 8,600 pesos for the same experience. · Also note that lunch came with 9 free soft drinks (Coke). Makes us wonder why soft drinks weren’t included for lunch on the first day. · For snacks, there were no Bananas in caramel sauce. We instead had Camote in caramelized sugar again. We also were served only 4 Tuna Sandwiches. Kind of validates our suspicion that Set C was prepared for only 4 people. What happened to the extra person? Was he included in Set A? Why don’t you go back and count how many pork chops there were in the picture. · Estimated cost based on Deal Grocer site and our research: 46,800 pesos for 4 pax. · The group from Manila arrived around 15:00 while the group from Cebu arrived around 17:00. · There was no welcome note directing us to report to a Game Master. · There was no Welcoming Rites. · We had to prod and ask for the briefing and welcoming rites several times. · Any of the staff we asked didn’t seem to know of such an activity happening for that night, strengthening our claim that the resort had no intentions of providing such an activity. · In addition, we were looking for the 20 performers that were suppose to welcome each survivor group as mentioned by the resort manager in her email. Remember that bold line from her stating that the deal was “downplayed” by Deal Grocer? 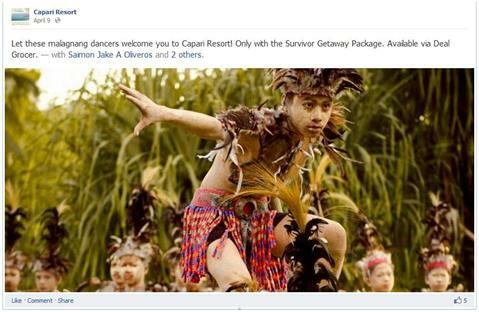 · Not only was it mentioned in the email, it is shamelessly being advertised at the resort’s Facebook page as well. · The resort manager sighted several times the rainy weather as an excuse. Apparently there was no contingency or back up plan. · There are several covered areas in the resort that could have served as the venue if the resort had real intentions to deliver what was promised. · Due to our insistent prodding, a briefing of the next day’s activities was done by the Resort Manager after we had dinner. She just stood at the edge of our table and spoke for about 3 minutes. · Apparently the next day’s schedule and activities were very flexible. 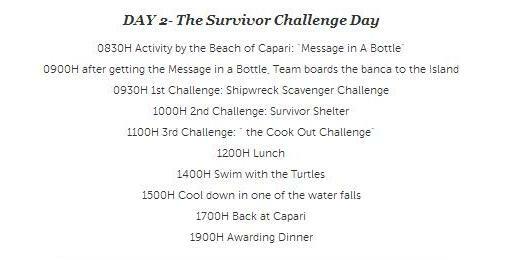 Another sign that the resort didn’t really prepare a program for the Survivor Challenge Day. · Sample itinerary starts at 08:30. On day 1, the resort manager said that their “Island hopping” usually starts at 09:00. 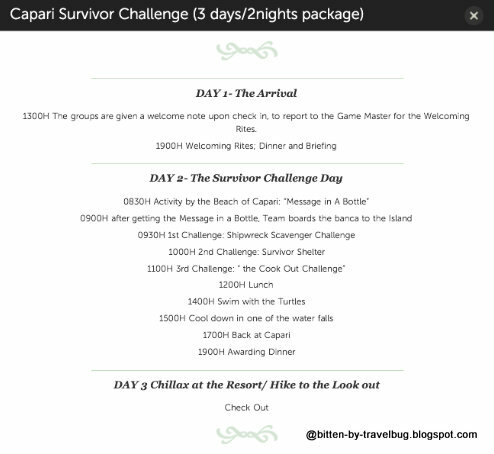 · Island hopping is quoted because that is how she referred to the Survivor Challenge Day. And I’ll show you later on that that was exactly what they only intented to offer. · Since it was raining in the afternoons in San Vicente, we requested for an early start of 08:00 the previous day. The request and idea came from us and not the resort. We had the impression that the resort manager really wanted to start 09:00 am and not 08:00 but, we were happy that she obliged to our request. · We requested to pass by the Long Beach as well. · There was no Message in a Bottle activity. Instead, we hiked to the tribal council and did the Maze challenge. Our concern of heading out early so we can dodge the rain later in the afternoon was offset because of this activity. Another sign of a lack of planning from the resort. · After the Maze Challenge we boarded the boat and headed for Long Beach. · We just passed by Long Beach. We didn’t swim. We didn’t dock. We just watched it from afar for about 5 minutes. · We headed next to Exotic Island. Just swam maybe an hour before our boatman/game master called us for supposedly another survivor game. Our boatman/game master hid 40 eggs in shallow water and tasked each team to look for their corresponding eggs. All in all the game took only about 5 minutes. · Our crew didn’t bring with them enough Snorkelling gear. They probably only had 2 masks and 1 snorkel ready. It was a good thing most of us brought our own gear. I guess snorkelling gear is not part of this survivor package. I wonder how the resort expected us to participate in the game without masks. Due to lack of equipment, some of our team mates had to be content with looking for eggs in areas where the water level was only knee deep. · There were only 2 huts in the island. The island seems to be public. At first we occupied both huts. After a few minutes though, another boat arrived and we had to vacate one of the cottages to give way to the new group. Note that we bought 2 deal grocer coupons. If we weren’t on the same group, would the 2 groups be forced to occupy the same hut? · After lunch, we were informed that “if we wanted” to do another game we can challenge the teams to build the best shelter out of only the raw materials in the island. We were dismayed and bored, we opted to skip this challenge and just head on to the next island. · The next island was the German island. We just swam there. · We inquired about “Swimming with the Turtles” they only cited that it was difficult because of the weather. If the weather was so difficult, then we shouldn’t have been out there in the first place. · There was no cook out challenge. · There was also no cooling down at the water falls. · We were back in the resort by around 15:00. · Finally a hint of planning and intent from the resort when they informed us that there will be an awarding ceremony at night. · Night time came, we had dinner. The resort served an extra fish dish and said that it was complimentary. Take it as the award for the winning team they said. That was the whole awarding ceremony. · Was this all worth 46,800 pesos? · Note that in El Nido, the whole day island hopping tours offered by El Nido Boutique is only at a maximum of 1,000 pesos per head (Tour C). It’s 1,400 pesos per head for Tour A if you take the Kayak with you. These island hopping tours come with free lunch as well (pork barbecue, grilled fish, mixed veggies, rice). · Note that in El Nido, you can rent a private boat with lunch for a whole day for only about 4,000 pesos. · Note that we bought 2 deal grocer coupons and the resort saved on both manpower and boat because we only took one boat. · Very small rooms with poor amenities. We can’t complain as we have been forewarned by the resort manager that it’s a “modest” resort. · One issue we had though was the fact that the extra person will have to sleep on a mattress that’s only laid on the floor. Each bed in the resort is equipped with mosquito nets for good reason. The extra bed will not have a mosquito net. How can they oversee this need? · In addition, the rooms are so small that when you lay out the extra bed on the floor it will either block the doorway or the path going to the toilet already. It’s not a very good situation to be in. · Shampoo and conditioner offered are mere L’Oreal sachets. In most rooms, only one set was placed even though they knew 2 people were staying in the room. We had to ask for extra. · Insistent prodding from the resort staff requesting that we check out early the next day. First it was Let-let, a resort staff, who approached me after dinner the night before to inquire what time we planned to leave the next day. When I informed her that we didn’t plan to leave until 11am she advised that we should leave earlier. She informed me that the vans will be waiting as early as 8am. · On the day of our check out, another staff approaches one of my companions asking her if we could leave earlier like say around 10am. She said the staff advised that we leave earlier so that we can drive in convoy with the other van carrying a different group of guests. This was supposedly for safety reasons. When in fact, I believe it would have been safer to leave at a later time to allow the roads to dry out a bit because it rained heavily around 6am during that day. Besides, the other guests were passing by Long Beach. An attraction we already have been to and are no longer interested in. · At around 10:30am, just about when we finished eating breakfast, the resort’s electricity shuts down. The resort manager informed us that there was a black out. We were beginning to feel unwelcomed. · A Korean contingent was checking in that day. Could they be the reason for all the rush? · We finish packing and finally board the van that was to take us to Puerto Princesa. It was in the resort since 8 am. When we boarded the van, we couldn’t understand why the driver wouldn’t still drive. As it turned out, the air conditioning was busted. He informed us that it was busted and that we should open the windows on our way to Puerto Princesa. What? There was nobody from the resort at the parking area to attend to us. · This was when I had to go back inside the resort to look for the manager and ask for a new van. Nobody checked the air conditioning all the time the van was parked in the resort. · After a few calls, the resort manager informed us that a replacement van would be coming in 5 to 10 minutes. At this time, the resort manager is already passing on the blame to the van company. · A man arrives on board a motorcycle. I thought he was a mechanic. It turns out he has planning to hitch a ride back to Puerto Princesa with our van. What? · The replacement van doesn’t arrive until 45 minutes later. · But before the replacement van arrived, I make a passing remark asking Sharon to turn the electricity back on. By some miracle, the electricity turns back on and we were allowed to wait inside our rooms with the air conditioning on. Could it be that there was no black out after all? It certainly looked that way. · The replacement van that arrived was from a different van company. It was from Fort Wally, a van service known to transport passengers publicly. It was stinky and dirty. Dried mud were present not only on the floor but on the seat covers as well. The windshield mirror had a crack on it. · Due to the delay in van arrival, we lost the time to stop somewhere and leisurely take our lunch. We had to do everything in a rush. 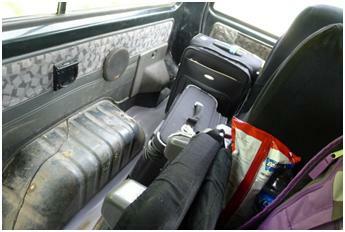 · Furthermore, upon arrival at the airport, to our embarrassment, the van driver asked us for the payment. Apparently, they weren’t informed on who would be paying them. The lack of intent to provide what was promised as a unique “Survivor experience” was very obvious from day one. The resort’s idea of a Survivor experience was to organizing a few games together with an island hopping experience. Except for the tribal council structure which we just visited, there were no banners, no set ups to contribute in providing a Survivor ambiance. If what we got was all that was intended by the resort for the deal, then the deal is grossly overpriced. We could have gone on our own without buying Deal Grocer coupons and it would have costs us less or probably just about the same amount. 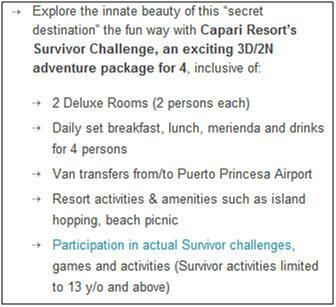 We chose the resort for the single reason to be able to experience the Survivor getaway that is currently being offered only by Capari Resort. If we simply wanted to go island hopping and snorkelling, we would have chosen a different destination. We have been to all kinds of resorts from all over the Philippines (from Davao all the way to Batanes). If it were only for the inconveniences, we would have been able to get over them in just a few hours. We encounter inconveniences on every single trip. We've learned to accept them. It is the lies, the deceit, and the lack of intent to provide that bothers us most. I am thinking where in resorts in Palawan I will want to check-in and this place is really cool. Hope we can drop by here soon. Thanks. Shien3143, where in Palawan are you going? I do not recommend you stay in this place.